Organised religions are losing its appeal on thinking minds all over the world especially in the West. And the vacuum created in the religious and spiritual space is getting filled by the self-development movement. In the west an increasing number of seeker are rejecting organised religions and turning to self-development as a source of true spirituality. Sometimes back a nonresident Indian living in Europe told this author that a common trend among young people in Europe is to say, “I believe in God but I don’t have faith in religion” or “I believe in realising my highest potential but I will not get into any religion” or “I believe in higher values like truth, beauty and goodness but I am not a religious person.” This brings us to the question how far this equation between self-development and spirituality is valid and true? Harmonious relationship with people with an emphasis on family, friendly kindliness. A self-development teaching may contain some religious or spiritual ideas as a secondary or supporting theme but not in its core. Let us examine briefly this self-development paradigm in the light of Indian spiritual perspective. According to Indian perspective our human nature is made of three qualities: Tamas, Rajas and Sattwa. Tamas is the quality of inertia, indolence, sloth, unwillingness to change. Rajas are the quality of dynamism of thought, feeling and action seeking for wealth, power, achievement and success. Sattwa is the quality of luminosity and balance which seeks for higher values like truth, beauty, goodness, harmony. Beyond Sattwa is our universal spiritual self. Viewed in this Indian perspective, the main objective of self-development paradigm is the development of the rajaso-sattwic personality or the ego to its highest potential. Self-development paradigm is predominantly rajasic but higher or more refined rajas with a sattwic flavour. The Indian ideal of self-development is Tamas subjugated by Rajas and Rajas illumined and guided by Sattwa; it is more or less similar to the Western ideal but more sattwic than rajasic or in other words more of sattwo-rajasic than rajaso sattwic. The other important difference between the Indian and Western ideal of development is that in the Indian path the main emphasis is on self-control and a calm detachment in the mind rather than an active self-assertion of thought and feelings. Let us now move on to the difference between the Indian spiritual paradigm and the self-development teachings of the west. The aim of Indian spiritual paradigm is to raise beyond self-development within the triple qualities of Tamas, Rajas and Sattwa towards a living and conscious union or identity with the universal and egoless and impersonal spiritual consciousness which lies in the inner most depth and source of our own self, beyond our body, life and mind. In an integral spiritual perspective, self-development can be a part of and a stage in our long-term spiritual evolution. In fact, when the self-development ideal, Indian or Western, is put into practice with sincerity and persistence it can lead to a rapid and accelerated psychological evolution from a crude tamaso-rajasic consciousness to a refined sattwo-rajasic status. However while self-development paradigm stops at this stage of a limited sattwo-rajasic perfection within the egoic consciousness, the spiritual paradigm goes beyond to the ego-transcending spiritual perfection. In otherwords, the spiritual paradigm aims at self-transformation and not just at self-development. When we move from the aims to the path and methodology, the way of self-development proceeds through active exercise and assertion of thought, feeling and will; identification with the sattwo-rajasic personality; and the development of a refined ego driven by nobler desires. On the other hand, the spiritual path proceeds through inner silence of the mind and heart; self-detachment from the rajasic, tamasic and sattwic ego; and a complete inner renunciation of ego and desire which includes both the cruder rajaso-tamasic as well as the nobler sattwo-rajasic ego. An important point to note here is that self-development path still moves within the realm of thought and dualities and aims at success and happiness in life. But the spiritual paradigm aims at a state of consciousness beyond thought and dualities like good and bad, success and failure, happiness and sorrow. Thus, while the path of self-development tries to improve the present condition of life by pursuing the brighter side of thought and life like positive thinking, success and happiness, the spiritual path aims at transcending altogether the polarities of thought and life through equanimity to and detachment from the positive and negative swings of life. And finally, self-development paradigm cannot bring about a complete transformation of human consciousness because it makes no effort to illumine the subconscious. But this spiritual transformation requires uprooting the seed of ego and desire from the subconscious. Thus there is a stage where ego and desire helps the evolution of the individual in progressing from a tamasic, inert and subconscious immersion in the physical consciousness to the more rajasic vital consciousness and further beyond to the sattwic consciousness of the higher mind. In this stage of human growth, self-development paradigm can be of great help in making accelerated evolutionary progress. There is a higher stage when we are called upon to progress further beyond the rajasic and sattwic mentality to spiritual consciousness. In this next stage ego and desire, even the higher and nobler sattwic ego and desire becomes obstacle to progress. In this stage the seeker has to raise beyond the aims and methods of self-development and follow the path of spiritual self-transformation. 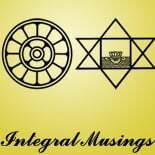 This entry was posted on August 30, 2012 by integralmusings in Religion, Spirituality & Philosophy.